This is definitely a rave! Seen @ farmers market in Bloomington, IL. Not sure if you can read the sign, but it says, “Free books.” No disclaimers. No fine print. I like these people. 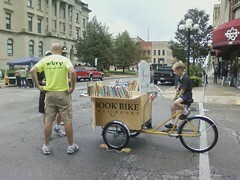 This entry was posted in Rave, Reading and tagged Bloomington, Book bike, Farmers Market, Free books, IL. Bookmark the permalink.